Running away with the carnival is easy but sticking with it through the end of the season is hard work. Once upon a time it was a rite of passage for American kids who wanted to see the world beyond their hometowns. Nowadays, the amusement industry still recruits high-school grads and college students, as well as retirees and others with merry-go-round memories and itchy feet. If you’d like to work in Coney Island or travel across the country with a carnival, now is the time of year to apply for a job. The job screenings are February 28, March 1, April 24 and April 26, 2012 from 12 noon till 6 pm at the Brooklyn Cyclones’ MCU Park, 1904 Surf Avenue in Coney Island. In past years, nearly a thousand people have shown up on a single day, so we recommend getting there early. Qualified candidates, who must be 18 years of age or older, will be referred for an interview. Seasonal jobs include Ride and Game Operators, Food and Beverage Service, Park Service, Customer Service/Retail Sales and Ticket Sales Associates/Cashiers. Lunatic Dance Team, Luna Park Coney Island. July 15, 2011. Photo © Jim McDonnell. All Rights Reserved. If you’re reading this after the screening events have taken place or can’t make it, visit the Career Opportunities pages at Nathan’s Famous and Luna Park and also check Craigslist. Luna Park currently has an ad on Craigslist for dancers and performers for the Lunatic Promotion Team, which pays $10 per hour. According to the ad, “the team will attend offsite promotions to inform new guests about the park and all the amazing things Coney Island has to offer. 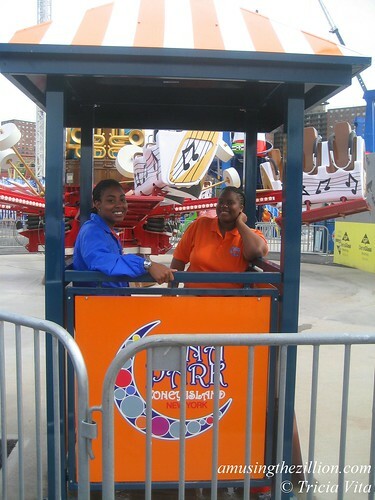 The second task will be to handle on-site events, promotions, photo opportunities and guests experience surveys.” Performers, including singers, dancers and DJs, will take part in the Cyclone roller coaster’s 85th birthday celebration and Coney Island’s first end of the summer concert. A dozen years ago, homesick for the midways of my carnival childhood, I went on the road with S & S Amusements, touring the Pennsylvania fairs. Since then, I’ve worked as a game agent with Wade Shows at New York City’s “Big A” Fair, the Delaware State Fair, the Michigan State Fair and the Central Florida Fair, and on Coney Island’s Jones Walk. One advantage to working in Coney is being able to sleep in my apartment at night, though when I got home from being on the road all summer it took a bit of getting used to having townhouses across the way instead of a Tilt-A-Whirl. 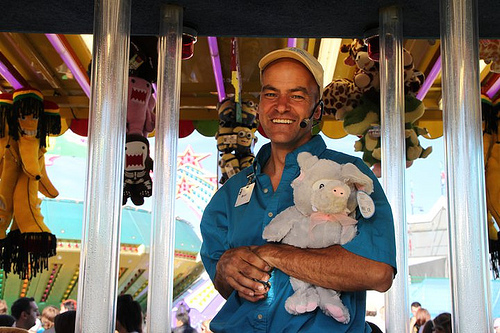 If the idea of traveling to 20 states and 4 Canadian provinces, including 10 of the top 50 fairs in North America is appealing, then you may want to check out North American Midway Entertainment’s Careers page. ATZ talked with Ed Dame, Director of Operations for NAME, “the world’s largest traveling outdoor amusement park,” about opportunities with his company. “Eighty percent of our employees are locals,” he said. “We advertise in newspapers and state workforce agencies.” The carnival company has an Employee Appreciation Program, which rewards workers with gift certificates, iPads and computers. Group activities include day trips to Major League baseball games, Banff, Niagara Falls and New York City, as well as BBQs, bowling nights and jamborees. Among the fairs played by NAME are The Eastern States Exposition in Massachusetts, Toronto’s CNE, the Calgary Stampede, Miami-Dade County Fair & Expo and State Fairs in Mississippi, Kentucky, Indiana and Illinois. February 2, 2010: Traveler: North American Midway’s Giant Vertical Swing at Super Bowl!